Ammerländer Swiss is produced with quality standards far above permitted regulations. Starting with only the freshest, pure Ammerland cow’s milk, Ammerländer Swiss follows a traditional German recipe that results in a delicious, approachable nuttiness and a smooth, perfectly pliable texture. 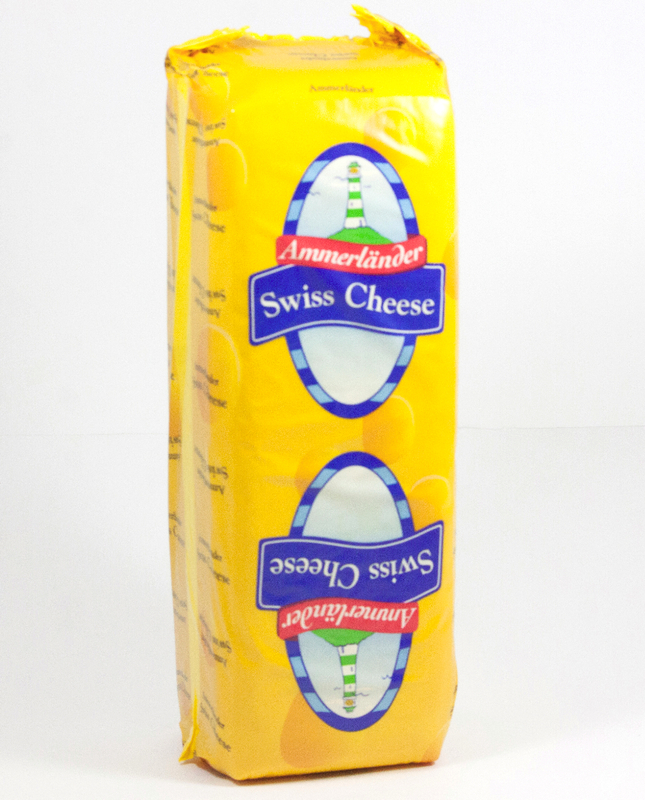 Ammerländer Swiss is made with non-genetically modified microbial rennet and is gluten free. In 1885, seven farmers from the beautiful North German Plains formed Ammerland, one of North Germany’s first dairy cooperatives. This region, not far from the North Sea coast at the very top of Western Germany, is famous for its unspoiled, lush grazing meadows so flat they seem to stretch endlessly into the horizon. Over 125 years later, although Ammerland now has about 2,200 members and is one of Europe’s largest and most technologically advanced cheese dairies, it remains an exclusively farmer-run cooperative, still firmly guided by tradition and dedication to quality. Residents of Germany’s Ammerland region say they are not talkers, but doers. What they do from the “Top of Germany,” where the expansive views by the naked eye are matched by far-reaching perspective on ultra-modern dairy innovation, is…... make really great Swiss cheese. Application: This ultimate sandwich stuffer is great with everything from hot pastrami piled high with sauerkraut and spicy mustard, or lean turkey and pesto in a pressed panino. Pairing: Works extremely well with Pinot Noir (German Pinot, known as Spätburgunder, is worth a try if a bottle can be found). Those who prefer white wine will enjoy Ammerländer Swiss with a nice well-balanced Riesling such as a Kabinett from the Moselle region of Germany. Azzurro presents their all-natural crisp and flavorful Turin-style breadsticks. A far cry from their soft, chewy pizza parlor cousins, grissini are long, thin, Italian-style breadsticks. Crisp all the way through, they can be seasoned or enjoyed plain to complement whatever is being served. An irresistible snack with a light, delicate taste; each torinesi style breadstick is made from the finest wheat flour, malt and generous amounts of olive oil. Golden and fragrant, Azzurro’s breadsticks have a fresh taste and rich texture that makes a dramatic, graphic centerpiece if served up in a large glass or vase placed in the center of the table.